Patrick McGahern Books has published their Catalogue 262. 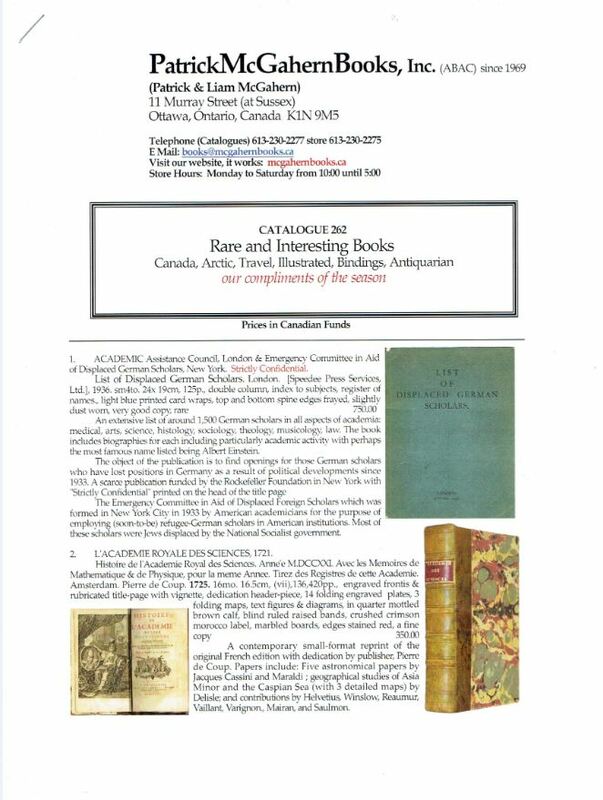 Rare and Interesting Books, Canada, Arctic, Travel, Illustrated, Bindings, Antiquarian. Most connect Canada or the Arctic with one or more of those other topics, but there are exceptions. This is not a large catalogue, just 27 items, but there is an interesting selection of varied material anyway. Here are a few items to be found. Captain Edward Belcher had served under explorer Frederick Beechey, and when the latter became ill, commanded one of his ships on an exploration that took him along the Pacific coast of South and North America, all the way to Alaska, and then as far as Hong Kong. When John Franklin disappeared with no trace on his mission to find a Northwest Passage in 1845, the British Admiralty sent numerous expeditions to find him, without success. The last of those missions was given to Edward Belcher, not beloved by either those above him or below him, but experienced. By the conclusion of his attempt, news had come home indicating that Franklin and his men had not survived. No more official missions were sent, though unofficial ones continued for years. Item 5 is a copy of Beecher's account of the last official Franklin search: The Last of the Arctic Voyages. Being a Narrative of the Expedition in H.M.D. Assistance, Under the Command of Captain Sir Edward Belcher, in Search of Sir John Franklin, during the Years 1852-53-54, published in 1855. Belcher did not bring back Franklin, but he did return with much scientific and geographical information. He also rescued Robert McClure instead, who had become trapped in the ice after searching for a Northwest Passage from the western side. Unfortunately, Belcher lost four of the five ships he commanded to the ice. He was court martialed, and acquitted, but never given such a command again. He was later made an admiral, but that was after his sailing days were over. Priced at CAD $4,000 (Canadian dollars, or approximately $3,145 in U.S. dollars). In a process similar to what happened in the United States, Canada granted the Canadian Pacific Railway millions of acres in the West so that they would build the first transcontinental railroad in Canada. The enticement was needed as, in the 19th century, that required building through thousands of miles of land essentially uninhabited by anyone other than the sparse native tribes, not likely customers for rail travel. The Canadian Pacific completed their task, and set about selling their land. The purpose was twofold, both to make money on land sales and fill the land with farmers and other settlers who would then use their services to transport goods to market. Realizing the number of potential settlers for their land was limited within the confines of Canada, they reached out to Europe, even opening offices overseas to encourage immigration. The Canadian government liked the idea too as they wanted to fill the indigenous lands with European settlers. Item 7 is an undated 40" x 25" poster (early 20th century), printed in London, announcing, Ready Made Farms in Western Canada. It encourages the British to "Get Your Home in Canada from the Canadian Pacific. Special Farms on Virgin Soil Near the Railway and Close to Schools, Markets, Churches &c are Prepared Each Year for British Farmers of Moderate Capital. Payments in Easy Installments." A cute farmhouse is depicted beneath a blue sky, with various family members wandering around, obviously enjoying their beautiful country life far from the damp, crowded streets of London. I don't know whether these farms were actually that close to schools, markets, and churches, but if not, you could always take the train! I wonder whether the British knew what winters are like on the Canadian plains? CAD $2,500 (US $1,964). This is a most unusual item for a McGahern catalogue, not really fitting into any of these categories, but a fascinating and humanitarian reminder of a terrible time. Item 1 is a List of Displaced German Scholars published in 1936. It was the work of the Academic Assistance Council in London and the Emergency Committee in Aid of Displaced German Scholars in New York. The Academic Assistance Council was formed in 1933 at the behest of William Beveridge, Director of the London School of Economics and Political Science, who would later be instrumental in designing England's social insurance programs, which provided assistance for the unemployed, sick and retired. After a trip through Austria that year, Beveridge realized the danger facing many German scholars, particularly Jews, and set about finding a way to find them positions in England and America where they would be safe to continue their pursuits. It covered people from all parts of academia, from science to arts, theology and music. This list includes the name of 1,500 such scholars and their biographies. Among those listed is Albert Einstein, though he was one who needed no assistance and already had work in the United States. The Emergency Committee in New York helped to find homes in the United States, with this publication funded by the Rockefeller Foundation. The AAC still exists today, aiding academics who need to flee other despotic regimes, though it is now known as the Council for At-Risk Academics. CAD $750 (US $589). Next we have The Rising Village, and Other Poems, by Oliver Goldsmith. No, not that Oliver Goldsmith. This one is by the other, Canadian Oliver Goldsmith. As the rest of the title explains, By Oliver Goldsmith, a Descendant of the Author of "The Deserted Village". This Oliver was the great nephew of the better-known Oliver, which technically does not make him a descendant. You will notice the similarity in the name of his poem and that of the earlier one written by his great uncle. It is a response, written in a similar style, to that of his Irish relative. Offered is the first Canadian edition from 1834 of Oliver the Younger's poems, originally published in London in 1825. It includes some poems not in that first edition. While the first was published in London, this Oliver was a Canadian, born and raised, living most of his life in Halifax, Nova Scotia. He is noted as the first significant Canadian-born poet. Item 8. CAD $1,200 (US $941). Patrick McGahern Books may be reached at 613-230-2277 or books@mcgahernbooks.ca. Their website is www.mcgahernbooks.ca.